If you’re a regular reader you’ll be well aware of my 90s obsession with Championship Manager as a kid. In many ways it basically set the tone for any kind of tactical analysis of the game, which probably explains why I’m not really too great when it comes to some of the in depth, data driven, statistical ‘Moneyball’ style approaches to tactics as some people are that you come across online. I just say what I see man. Which is why I was so pleased when I saw the squad for tonight’s game. It’s a squad packed full of young players and as far as I’m concerned I’m a-ok with that. If I put my teenage ChampMan mindset into gear it’s exactly what I would have done in Emery’s shoes. In fact in ChampMan when you had so many players injured you used to get made up random youngsters appear in a greyed out font. It was literally the games equivalent of asking some kids in the park if they had brought any boots with them. Yeah, that; that’s what I’d be doing all night long with tonight’s game in Kiev – ALL THE GREYS!! It’s a youthful line up and whilst Emery talked up the importance of the club’s history in blooding young talent, whilst he spoke of the need to ensure that he uses all of the resources at his disposal and how he wanted to win the game tonight as much as any game, we all know he’s got a bit of a ‘free hit’ with this game. The fact we can still top the group if we beat Qarabag at home has ensured this and so when you look at the fixture list and the fact there are two big games coming up within three days from this Sunday, this move is by far the most sensible for me. And look, whilst I’m advocating the use of all the young players, the reality is that the team that takes to the field come 6pm UK time will still have plenty of experience about it. Petr Cech will start in goal, Lichtsteiner will either be right back or centre half, Rob Holding looks like he might miss out on Sunday as he’s travelled but he’s been in the team regularly this season, Mo Elneny is not everyone’s cup of tea but he’s a senior player and he’s ok as a back up for a game like tonight, Aaron Ramsey travels and could partner Guendouzi in the middle, whilst in the attacking positions Mkhitaryan is in the squad and will surely play tonight. That’s seven of the eleven that I would class as more ‘senior’ pros and that doesn’t include Corporal Jenkinson so we’re not exactly talking a whole youth team. The real question is whether the game will actually get to be played or not, after Vorskla officials said they could not guarantee it given the match has been moved to Kiev from their normal ground, currently under martial law. I don’t think that’s a throwing out the toys of the pram from the club either, actually, because if you think about all of the preparation that goes in to a game. Communications across the club, stewards, ticket officials, retail outlets selling merch, supporter travel laid on by the club, local policing, printing of programmes, distribution, etc, etc. The list goes on and on and so just saying “ahh we’ll just play here” at such short notice isn’t as easy for the home club as you think. I still think they’ll get it done though. The sanctions and the cash that the club receives from the Europa League are vital to teams like Vorskla so I don’t see it not happening. And if it happens then it’ll basically be two teams playing away which may play to our advantage. 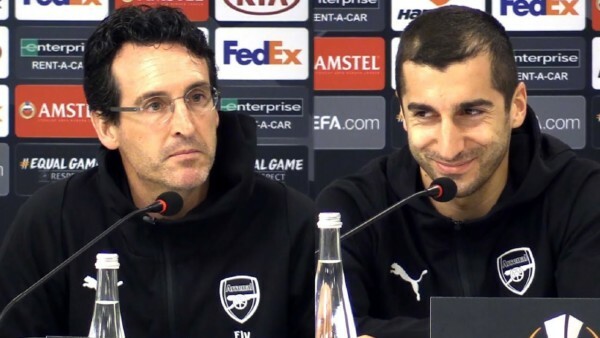 The home team will hardly feel at home and after the first leg in which we really did play with our dinner a bit by not putting more against the Ukrainians, I expect to see plenty of hunger from some of those Arsenal players tonight. Some of them have points to prove. Cech that he can win his place back. Ramsey that he can still have a big impact on our season. Mkhitaryan that he can be the ‘old Mkhi’ and not the Jose-wrecked version that we’ve seen in the last few games. We need to have some performances tonight and whilst it’s the young players that we all love to get excited about, I want to see some of those senior pros step up. How about a goal for The Corporal too? Wouldn’t that be an awesome early Christmas present? In terms of Vorskla I only know what I saw last time they played us and whilst they showed some spirit in the first half to frustrate us until we got the first on the half hour mark, they didn’t look to have too much attacking threat until the game was in the dying embers and we started to mess about a bit. Our players are technically superior and that’s why I’m hoping we see even the young players impose themselves this evening. This isn’t a Premier League London derby against someone like West Ham in which there will be tight moments. This Vorskla team should trouble us too much. But this is The Arsenal and we do have a habit of tripping up sometimes. Hopefully that doesn’t happen tonight because it would be good to give some of those young players a run out. That’s it from me today. Let’s hope for another three points and a good performance in Ukraine from the lads.